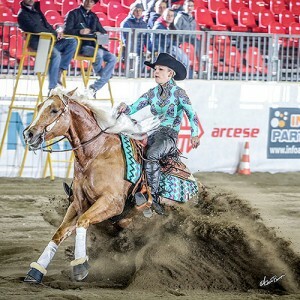 Cremona, April 1 – Provided by Simona Diale/IHP – The 2019 edition of the National Reining Horse Association (NRHA) European Futurity counted 66 horse-rider-combinations in the €69.207-added* European Non Pro Futurity qualifier (*subject to change in Nominations). Riding to the high score in the Level(L)4 division with a 216.5 score were Gina Schumacher and CS Ranch Management SA’s Shiney Dun Face (Pale Face Dunnit x Sheza Shiney Chic). 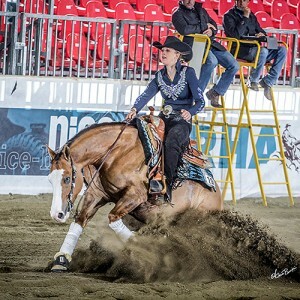 With only three combinations left to go, the multiple NRHA Non Pro World Champion and her gelding beat the score posted by Fabienne Kuratli-Suter — a 215 — posted early in the draw. The Swiss rider and her Alpha Top Gun, a gelding by NRHA Million Dollar Sire Hollywoodstinseltown out of Smoking Walla Wanda topped the L3 and L2 divisions. A young Francesca Ferrarol of Italy, riding Spat Enterprise (Spat Olena x Fame Oak Enterprise), owned by Maurizio Ferrarol, posted the high score in the L1 division. 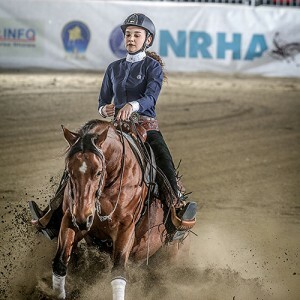 The first day of competition also hosted the first section of the €162,223– added* NRHA European Open Futurity go round (*subject to change in Nominations). The 2018 NRHA European L4 Open Futurity Champion Gennaro Lendi rode Grey Stone Ranch’s Showgirl Shining Gun (Colonels Shining Gun x Shes A Lil Showgirl) to a 220, the top score of the day. On Tuesday, April 2, the second section of the Open Futurity qualifier, counting 119 horses, will open the day. Riders in the Non Pro European Futurity who did not automatically qualify for the finals will have a chance to earn a ticket to the finals through the Consolation run which will close the day.